The President of India, Shri Pranab Mukherjee has condoled the passing away of Shri R.S. Gavai, veteran Ambedkarite and former Governor of Kerala, Sikkim and Bihar. In his condolence message to his wife, Smt. 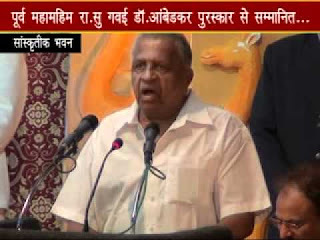 Kamal Gavai, the President has said, “I am sad to learn about the passing away of Shri R.S. Gavai. Shri Gavai was Member of the Maharashtra Legislative Council from 1964 to 1994, Deputy Chairman of the Legislative Council from 1968 to 1978, Chairman from 1978 to 1984, and Leader of Opposition in the Legislative Council from 1986 to 1988. Shri Gavai served as Member of Parliament (Lok Sabha) from 1998 to 2000 and Member of Parliament (Rajya Sabha) from 2000 to 2006. He served the nation with distinction as the Governor of Kerala, Sikkim and Bihar. A close associate of Dr BR Ambedkar, Shri Gavai rendered yeoman service as Chairman of the Deekshabhoomi Smarak Samiti in Nagpur. The nation will always remember his valuable contributions. Please accept my heartfelt condolences and convey the same to the rest of your family members. I pray to the Almighty to give you and other members of the family strength and courage to bear this irreparable loss”. The President of India, Shri Pranab Mukherjee has condoled the passing away of Shri Kalpataru Das, Member of Parliament (Rajya Sabha). In his condolence message to his wife, Smt. 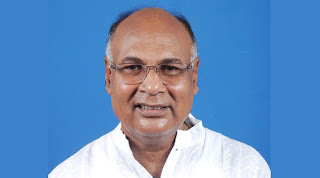 Pratima Das, the President has said, “I am sad to learn about the passing away of Shri Kalpataru Das, sitting Member of Parliament in the Rajya Sabha from 2014. Shri Kalpataru Das served the nation with distinction in various capacities including as Member of Legislative Assembly and Minister in the State Government. He dedicated his life for the welfare and development of the people and State of Odisha. In his death, the nation has lost an eminent leader and social worker whose long years in public service will be remembered for years to come. The President of India, Shri Pranab Mukherjee will visit Karnataka on July 27 and 28, 2015. On July 27, 2015, the President will inaugurate the centenary celebrations of University of Mysore. On the same day, he will also inaugurate the centenary celebrations of Federation of Karnataka Chamber of Commerce and Industry in Bangalore. On July 28, 2015, the President will attend the second convocation of Central University of Karnataka at Kalaburagi. He will then visit the NIMHANS campus in Bangalore to attend a special function in which NIMHANS will be dedicated to the nation as an Institute of national importance. The President will on the occasion also inaugurate a magneto encephalography facility and the NIMHANS Museum before returning to Delhi. Prime Minister, Shri Narendra Modi, has greeted the people of the Republic of Maldives on the 50th Anniversary of their Independence. "Greetings to the wonderful people of the Republic of Maldives as they celebrate 50th Anniversary of their Independence. Maldives is a valued partner in the Indian Ocean neighbourhood & our ties are built on a very strong foundation," the Prime Minister said. Prime Minister, Shri Narendra Modi, has greeted the people of Liberia on their National Day. "Best wishes to the people of Liberia on their National Day. I hope India-Liberia ties grow further in the times to come," the Prime Minister said. Warning for Heavy to very Heavy Rainfall Issued in Various parts of the Country. Indian Meteorological Department has issued warnings of Heavy to Very Heavy rainfall in various parts of the country for over next two days. Areas where such rainfall is expected to occur are West Madhya Pradesh, East & West Rajasthan, Gujarat, Saurastra & Kutch region. Heavy to Very Heavy rainfall is expected to occur in Odisha and Gangetic West Bengal thereafter on Tuesday and Wednesday.